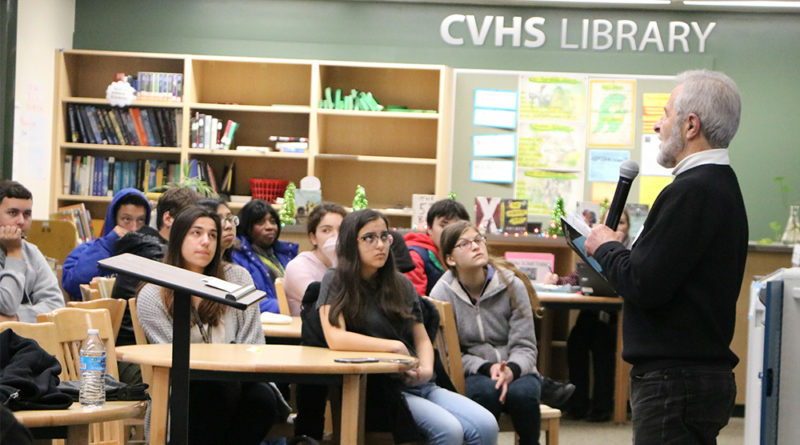 CVHS students had the chance to view a special presentation from George Elbaum on Dec. 12. Elbaum is a Holocaust survivor who escaped Poland, moved to the U.S., became a aeronautical engineer at MIT, and represented American firms in the Soviet Union. Elbaum is part of a program called Facing History and Ourselves and travels around the world sharing his story in-person to youth. Our generation will be the last one that will have the ability to meet survivors like Elbaum. Elbaum was one year old when war broke out in Warsaw, Poland in 1939. He and his mother were the only two out of the 12 people in his family to survive the Holocaust. During the war, his mother got a job and was able to pay for Catholic Poles to take care of her son whom she was only able to see about once every two months. After the war, he and his mother had lived in Poland but he had ended up moving to Paris because Warsaw was still dangerous. “I give my survival to pure luck and the intelligence of my mother. She was so clever and did everything in her power to keep me alive and I was one of the very lucky few who avoided death,” said Elbaum. In 1949, Elbaum and his mother came to the United States to start their new life. Within a year, Elbaum was fluent in English. In high school he had only applied to one college, MIT, and was accepted. From then on, he didn’t talk about his childhood until about 2009 when he understood the importance of his story. Elbaum’s story is one that is truly unique and something that students are always going to remember. He is someone who started life from nothing, living in absolute fear of death every day, to someone who became extremely successful and pursued his dreams in spite of the past. He hopes his story will encourage students to be all around nicer people and give the world a much different look.